West Englewood, Austin and New City are the three Chicago community areas that received the scarcest amount of bank loans from top lenders in Cook County in 2014, according to an analysis of a 79,000-record dataset available on the website of the Bureau of Consumer Financial Protection. In other words, African-Americans and Latinos – the majority of residents of these areas – still struggle to receive mortgage loans from banks. West Englewood, for example, had five census tracts among the top 20 tracts most neglected by banks in lending In West Englewood, 92.4 percent of residents are African-American. In 1975, Congress enacted the Home Mortgage Disclosure Act (HMDA), a federal law that requires some financial institutions – the ones who originated at least 25 closed-end mortgage loans or at least 100 open-ended lines of credit in each of the two preceding calendar years – to report HMDA data to the public. Every year by March 1, national data is collected by the Bureau of Consumer Financial Protection and later published on the web. The mortgage industry uses the data to inform business practices. Local communities check the data as well to ensure that “lenders are serving the needs of individual neighborhoods,” as it stated on the Bureau website. In the case of Cook County, a 79,029-record dataset is available for the year 2014. Mortgages are for first-lien and 1-4 family homes, including manufactured housing. 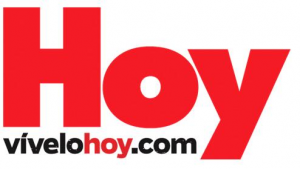 The property can be owner-occupied as a principal dwelling or not. By filtering the dataset appropriately, it’s possible to determine the top lenders in Chicago, and the census tracts in the city most neglected by banks. Results show that the most neglected census tracts are located in community areas such as New City, West Garfield Park, Chatham, Roseland, Austin and West Englewood. 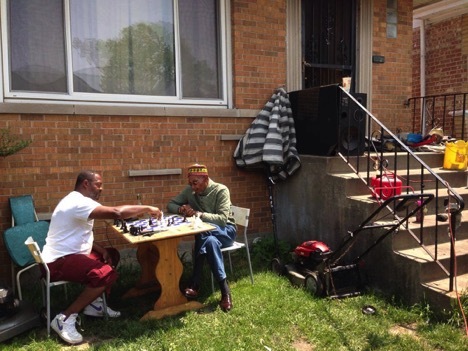 In such community areas, residents are mostly African-Americans and, in some cases, Latino. 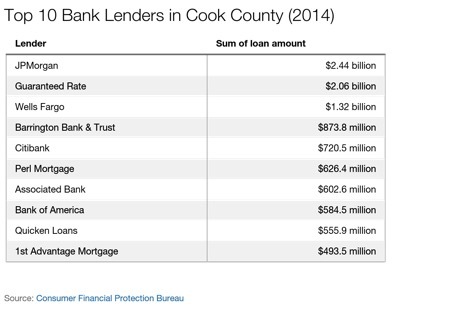 The top mortgage lender in Cook County in 2014 is also the largest bank in the U.S., JPMorgan Chase & Co. According to the dataset, the New York City-based financial services holding company made loans for mortgages for over $2.44 billion, or less than 56.4 percent compared to $5.6 billion in 2003. Ten years ago, the bank was criticized for its performance on minority loans by the National Training and Information Center, now called National’s People Action, a Chicago-based association for economic justice. JPMorgan replied that $1.3 billion of the total $5.6 billion was to home loans to minorities. JPMorgan Chase spokeswoman Christine Holevas declined to comment for this story. Number two in the lending rankings is the national mortgage company Guaranteed Rte, headquartered in Chicago, with more than $2.06 billion in home loans. A spokesperson also declined to comment for this story. Others top lenders include Barrington Bank & Trust (almost $873.8 million), Citibank ($720.5 million), Chicago-based Perl Mortgage ($626.4 million), Associated Bank-Corp ($602.6 million), Bank of America ($584.5 million) and Quicken Loans ($555.9 million). Illinois-based 1st Advantage Mortgage ends the ranking with $493.5 million. Mark Rodgers, director of Citi public affairs, said in an email that Citi considers each mortgage applicant by the same objective criteria. “These objective criteria, which are blind to race, ethnicity, gender and any other prohibited basis, include credit scores, loan to value (LTV) ratios, debt to income (DTI) ratios and other key factors. Using these and other objective criteria allows us to set rates that are consistent with the risk profile of each borrower,” he said. Bank of America spokeswoman Diane Wagner also declined to comment for this article. 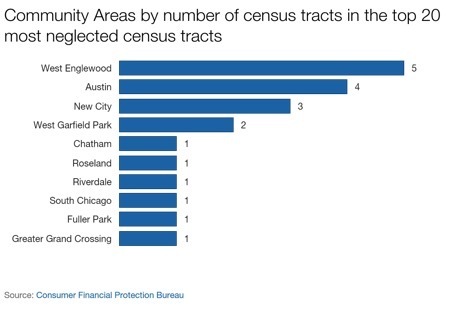 In the ranking of 20 most neglected census tracts, five of them are part of community area West Englewood, four of them are part of Austin, three of them of New City and two of them in West Garfield Park. Other community areas such as Chatham, Roseland, Riverdale, South Chicago, Fuller Park and Greater Grand Crossing have one census tract each in the top 20. In 2015, Cook County sued Wells Fargo and Bank of America over their lending practices. In County of Cook v. Wells Fargo & Co, the county alleges that Wells Fargo and another 375 unnamed Wells Fargo entities issued “predatory subprime mortgage loans” that went into default and drove the mortgaged properties into foreclosure. Among more than 61,000 mortgage loans made by Wells Fargo in Cook County from 2004 to 2007, more than 25,000 (41 percent) were made to minorities. In the lawsuit, Wells Fargo argued that there were a whole host of reasons—including the recession and unemployment rates—that affected the number of defaults and foreclosures. Wells Fargo’s motion to dismiss the lawsuit was granted by the court. The current mortgage rate situation in Chicago is directly related to the Great Recession of 2007-2009, and specifically to the subprime mortgage crisis, said Tassos Malliaris, an economics professor at Loyola University. Between 2002 and 2007, the standards to give loans were not strict, because investment banks were making huge profits by combining loans – even, and mostly, high-risk loans – in packages and then selling those packages (called Collateralized Debt Obligations, or CDOs) to speculators. “It was good and easy,” said Angie, 46, a West Englewood resident who got a $65,000 mortgage in 2002. At that time, she explains, Northern Trust was financing mortgages as part of a program for targeted areas. “If you agreed to buy in West Englewood, they would give you a special interest rate,” Angie said. In her case, the interest rate was 6 percent. Things changed after the financial crisis. After millions of people lost their houses and jobs, in 2010 Congress passed the Dodd-Frank Wall Street Reform and Consumer Protection Act. As a consequence, said Malliaris, a decline in loans should not necessarily be interpreted as a decision by banks to deny loans to minorities. Loans could be denied because of the need to comply with the law. There are several other technical reasons involved in the application process that could lead to loan rejections, according to Geoff Smith, executive director at the Institute for Housing Studies at DePaul University. Banks investigate parameters such as the applicant’s credit score, the value of the property compared to the amount of the potential loan, the applicant’s income compared to the loan monthly payment, other financial obligations the applicant might have (for example, student debt), the applicant’s employment history, the amount of savings and the general condition of the property. The recession impacted many of those realms, causing people to lose income and homes to lose value, and making it hard for prospective buyers to pass the appraisal part of the mortgage process. There are many churches in Englewood and West Englewood, including New Joy Missionary Baptist Church, The Shining Light Apostolic Church, Nazarene All Nations Church, Spirit Redeemed Baptist Church, True Church of Christ Divine and New Generation Harvest Church. While the neighborhood’s spiritual life may be thriving, the commercial situation is a different story. Liquor stores, small grocery stores and currency exchanges are often the only options for residents to buy food and get financial services. There are no banks or supermarkets to be seen. “That’s all they do: fire and shoot,” said Stef, 33, a West Englewood resident who was born and raised on the South Side. She explains that West Englewood gangs often gather in Lindblom Park and that she’s scared of walking outside. “I want to get out of here,” she said. Denise King, a retired 62-year-old woman who worked for 24 years at the admission office of the University of Illinois Medical Center, has witnessed the changes the neighborhood has experienced. Even though the Great Recession, the Dodd-Frank Act, a failed appraisal process and a bad credit score might be reasonable explanations of loan denials, some people think that racism is the real reason they did not get a loan. 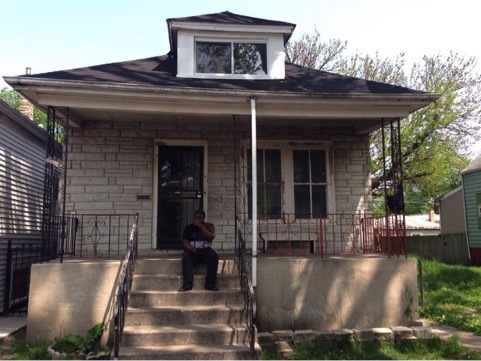 In 2010, Perida Davis tried to get a $10,000 loan from Citibank to repaint her house located a couple of blocks from West Englewood, she said. At that time, she was living with her son, an engineer, and she had a job as well: she was a cook at the Henry O. Tanner Elementary School, in Park Manor. Davis said she has been living in the area for 17 years, after having bought a house for $80,000 in 1998. She said her credit score was “pretty decent.” However, her application for a loan was denied. “They tell me that the recession was the reason,” she explained. But she thinks the real reason might be different. “We were denied a loan because of the color of our skin. Banks simply don’t give loans to black people,” she said. 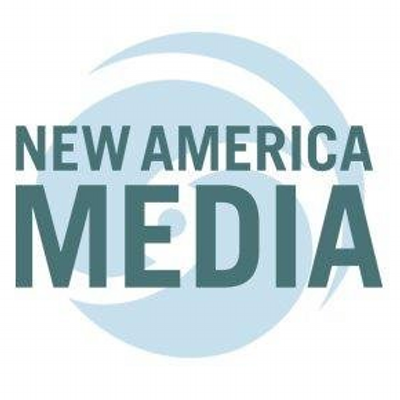 Lucia Maffei is currently in Medill’s MSJ program. Maffei wrote this piece as part of Darnell Little‘s Advanced Data and Mapping class, Spring 2016.